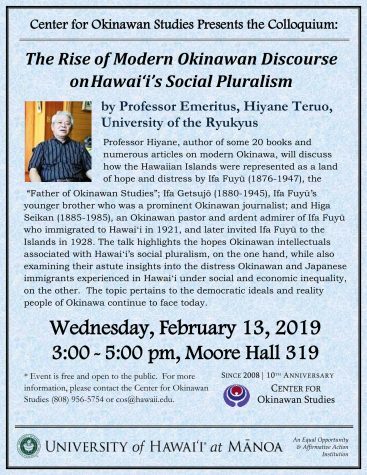 On Wednesday, February 13, Center for Okinawan Studies will host a colloquium by Hiyane Teruo, Professor Emeritus, University of the Ryukyus titled, The Rise of Modern Okinawan Discourse on Hawai’i’s Social Pluralism. Event is free and open to the public. 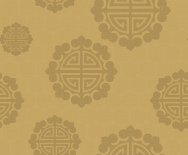 For more information please contact: The Center for Okinawan Studies (956-5754) or cos@hawaii.edu. Information on Professor Hiyane: the author of some 20 books and numerous articles on modern Okinawa, will discuss how the Hawaiian Islands were represented as a land of hope and distress by Ifa Fuyū (1876-1947), the “Father of Okinawan Studies”; Ifa Getsujō (1880-1945), Ifa Fuyū’s brother and outstanding journalist who died in the battle of Okinawa; and Higa Seikan (1885-1985), Ifa Fuyū’s follower and Okinawan pastor who immigrated to Hawai’i. The topic of relevant to the democratic ideals and reality that Okinawa continues to face today.